Garlic Scapes? What Are They? Garlic Scapes. They are all looking to the south! This time of year you might hear about scapes. They might show up in Farmers Markets if you are lucky. Just what the heck are they? 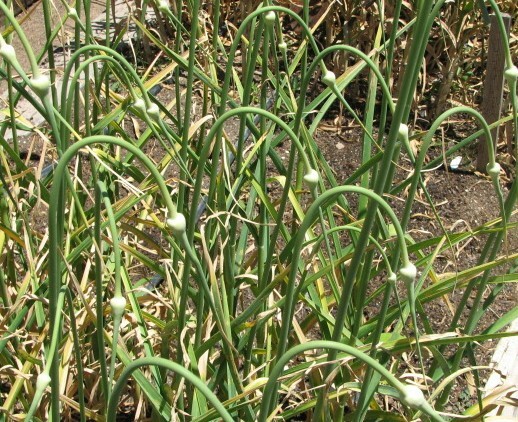 Scapes are the long curly green leafless things that grow out of garlic, also known as garlic tops, garlic shoots, garlic spears or garlic flowers. They are extremely tasty green shoots that grow from “heads” of hardneck (or topset) garlic which are usually discarded before harvesting in most of the U.S. Garlic scapes are a versatile and nutritious culinary treasure that is valued in Korean, Chinese, Thai, Polynesian, and coastal French cuisine. They can be hard to find if you don’t grow your own, but look for them late spring time, early summer. They are garlicky but with a fresh “green” taste. They can be used in any dish where one usually uses garlic but wants a brighter, more complex garlic flavor with less bite than one would get from standard garlic cloves. Garlic scapes work well in soups, salads, stews, salsas, dips, guacamole, omelettes, frittatas, souffles, marinades, pesto, salad dressings, and stir-fry. 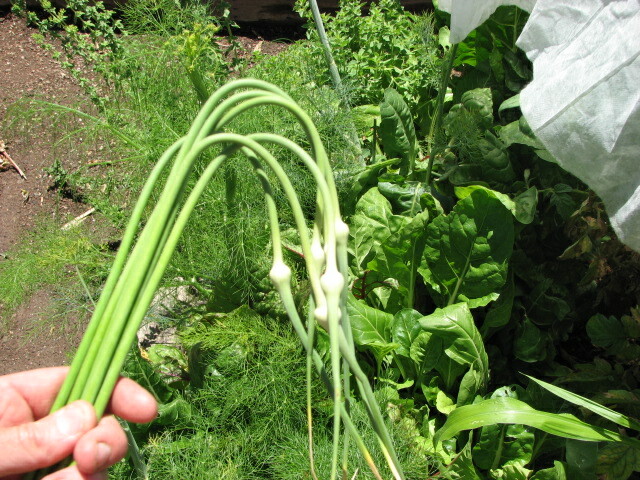 Harvest garlic scapes when they are curled and the flowers have not yet opened. 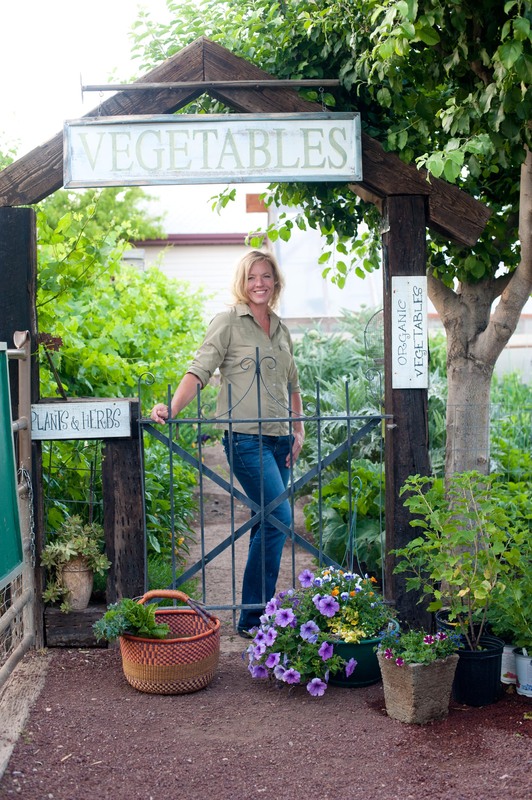 By doing this you will produce a larger bulb and be able enjoy the scapes in cooking or raw. I have found that the scapes growing in our hot climate can be tough the further down the stem, so at times I am only using the top 6- 8″ of the scape including the bud. One little tip about watching the scapes as they grow is they will straighten when the bulb has reached full maturity. By this time the flower will start to open. You can also use the little flowerets before they dry out. I like to sprinkle them over a salad or in any savory dishes. They have a peppery taste. Try something new! That’s what makes growing your own so wonderful! Garlic has such great character at all stages. A simple but wonderful garlic scape spread can be made by chopping some up and mixing them with softened cream cheese (or sour cream) and dill. When added to mayonnaise to make an aioli, the flavor of chopped garlic scapes becomes milder and the savory notes are more apparent. Use the scapes as a great side dish. Here’s a simple but good recipe for roasted garlic scapes. Take the scapes and put them in a lightly oiled roasting pan, top with salt (kosher or sea salt works best). Put the loaded and covered pan in a hot (425°F) oven for 30 to 45 minutes or until they are beginning to turn brown. serve as a side or main dish. Tastes like roasted garlic but creamier. Puree’ scapes and olive oil in a food processor until smooth. Stir in Parmesan, walnuts and lime or lemon juice and season to taste. I think I just dug some of these up- not realizing what they were until I smelled garlic. Live and learn. Thanks.